Seems like an age ago, but my camera tells me this was today. Stood looking over the sea at Snettisham Nature reserve, watching the waders - did I mention just how cold it felt in the wind today! wow, that's a lot, hope you've warmed up now! Good heavens, looks like a scene from a Hitchcock movie. It does look bleak with nowhere to shelter from the wind. Wow -- so many! I agree with Babs that it looks like a scene from The Birds! By the thousands! Great image. 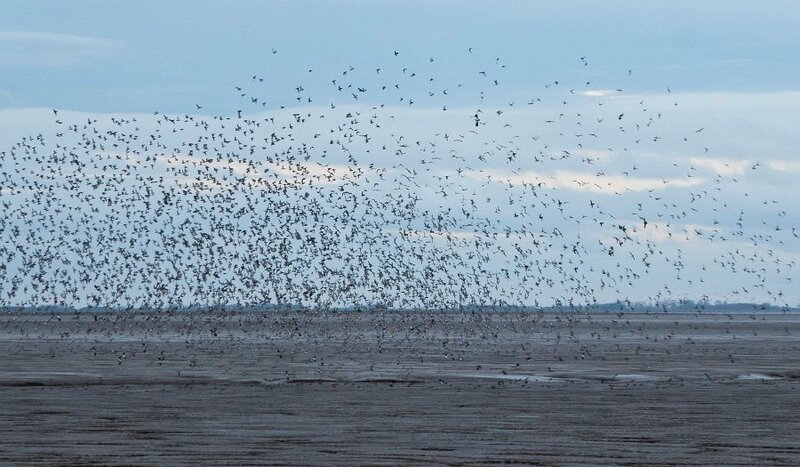 Quite breath-taking to see that amount of birds in flight.You managed to get a really clear shot of them. That's an amazing capture Helen. Hope you had a hot drink at the end of it - or wine at the very least. It does look rather cool there! Great image of the hundreds of birds.